Looking for something quick and fresh to eat? 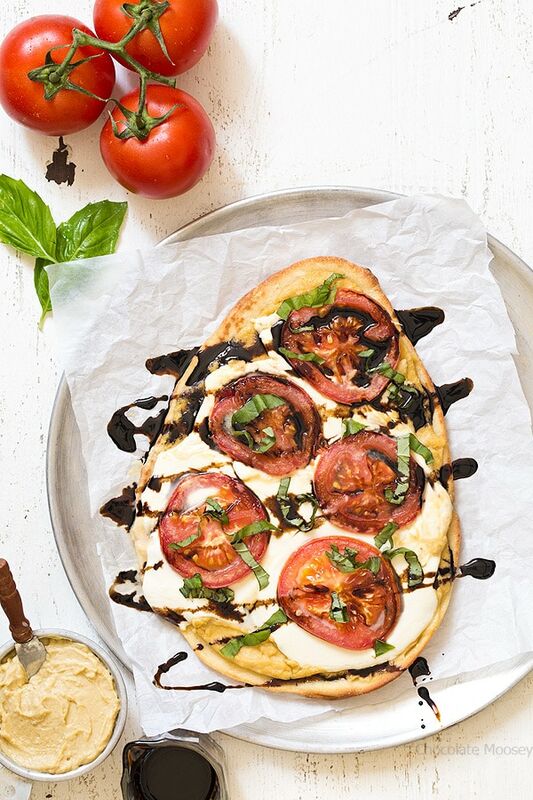 Try this Caprese Hummus Flatbread Pizza with fresh tomatoes, sliced mozzarella cheese, basil, and balsamic vinegar. With summer creeping closer and closer, one thing I’m really looking forward to are farmer’s markets. There are two in particular in Pittsburgh where I walk away with a bag full of, well, everything – tomatoes, peaches, zucchini, corn, fresh herbs. Sometimes I tend to buy more than I have planned, so when I get home, I stare at my bounty and go, well now what? For this reason I have an arsenal of simple ideas to make. For example, when I buy tomatoes and basil, I make caprese – a simple Italian salad of tomatoes, sliced mozzarella, and basil. 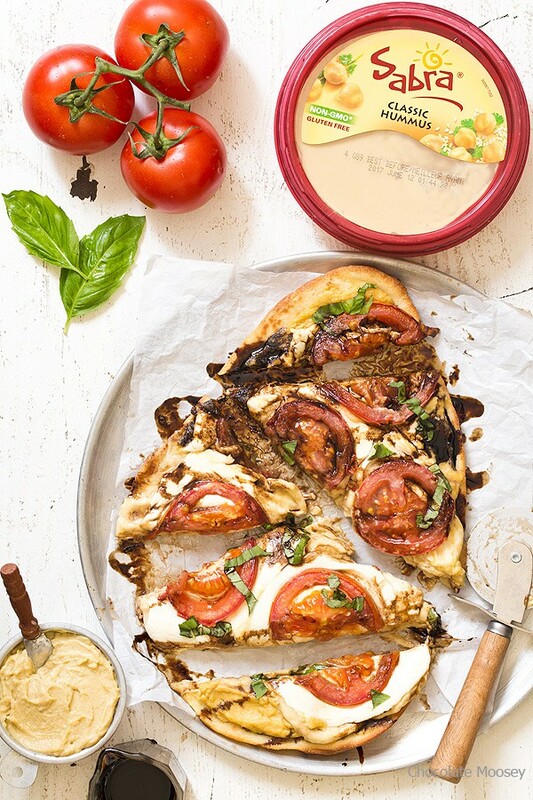 To make it more substantial, I turned it into Caprese Hummus Flatbread Pizza, which is loosely inspired by those cold veggie pizzas you often see at summer parties. You can serve this recipe hot or cold, depending on whether you want your mozzarella cheese melted. Drizzled on top is a balsamic vinegar reduction, which is a fancy way of saying slightly thickened vinegar that isn’t as acidic as straight from the bottle. I made this recipe easier and quicker by using store-bought flatbread. However, you can also use homemade pizza dough. I’ve used hummus in past recipes, but every time I mention it, someone always asks what it is. Hummus is a Middle Eastern spread made from ground chickpeas blended with tahini (sesame paste), olive oil, lemon juice, and a few other ingredients. Most people eat it with pita chips, but it can also be used as an ingredient. Hummus is becoming more and more mainstream. In fact, this Saturday May 13 is National Hummus Day, and I’m celebrating with Sabra. You probably recognize them from the store with their red lid containers. My love with them started when I won a year supply several summers ago. That’s… a lot of hummus. 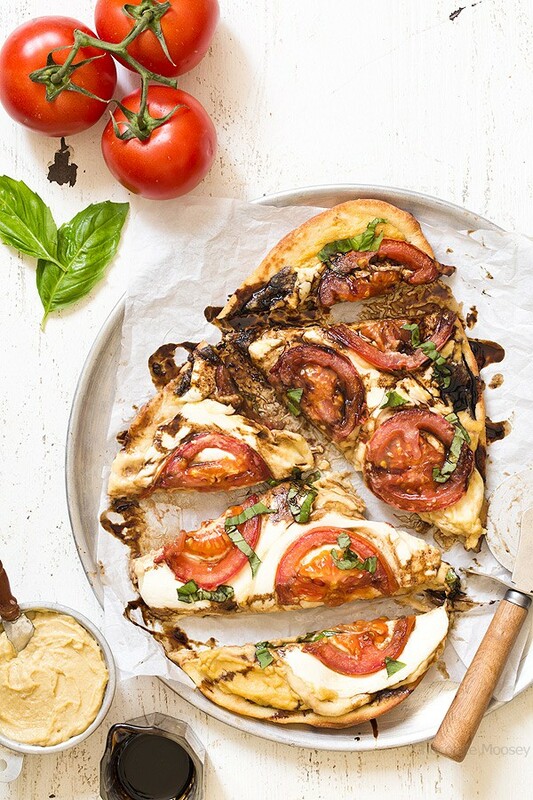 Caprese Hummus Flatbread Pizza also makes a good unofficial meal – a pre-dinner snack to feed your hunger while waiting for dinner to cook. And considering how messy it can get after cutting, there are no formal meal rules here. Preheat oven to 425F. Have a baking sheet ready. Spread the hummus on top of the flatbread or naan. 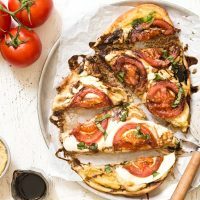 Top with mozzarella and tomatoes. Bake for 8-10 minutes or until the cheese has melted. While the pizza is baking, in a small saucepan whisk together the vinegar and brown sugar and bring to a boil. Boil until the mixture has reduced to half and is slightly syrupy, about 5 minutes. Remove from the heat. 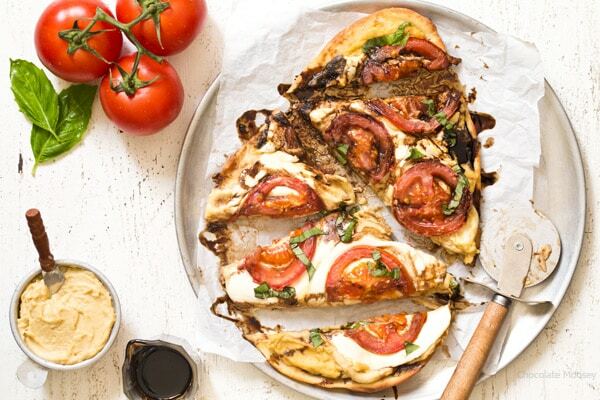 When pizza is ready, top with basil and drizzle with balsamic mixture. This pizza can also be served cold. Skip steps 1 and 3. SO pretty! And who doesn’t love pizza? I can’t wait to try these! Thanks for sharing Carla. This sounds and looks delicious! Love your photos. Tried it and loved it. This is definitely a keeper!!!! I made this tonight with some hummus I made. It was so delicious! Will definitely make again! Glad you enjoyed it, Mia! Thanks for letting me know.